Excellent profit potential (depending on the order size). Affordable selling price to end customers. Delivery charges apply, but decreases on an invoice value sliding scale. For more info read our information pack. Step 1 Register as a Distributor, by completing the online Application form. Step 2 Choose your Starter pack option. Step 3 Pay for your Starter pack and you’re in business! In the case of a salon, pharmacy or any other retail environment – Display units are available, for more info email info@papillon.co.za. A stylish silver cosmetic case and material drawstring bag. A fragrance list and Pure Skin info guide. 70 5ml atomizers/testers for skin testing on customers. (All fragrances in the Papillon range) 50 anonymous business cards to promote your business & ensure that customers contact you for repeat orders. An order/receipt book to keep track of your orders, payments and customer’s information.1 branded pen to record orders. 1 book of 100 smelling strips – if customers don’t want to test fragrances on their skin. 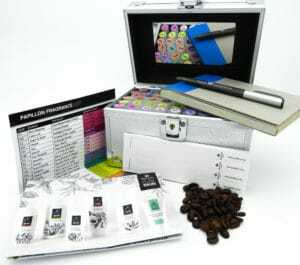 Container with coffee beans – for customers to neutralize their sense of smell when testing different fragrances. 2 material drawstring bags. A fragrance list and Pure Skin info guide. 30 x 5ml atomizers/testers for skin testing on customers (20 Top selling Female and 10 Top selling male). 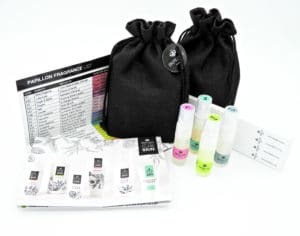 1 book of 100 smelling strips – if customers don’t want to test fragrances on their skin. 1 material drawstring bag. A fragrance list and Pure Skin info guide. 15 x 5ml atomizers/testers for skin testing on customers (10 Top selling Female and 5 Top selling male).